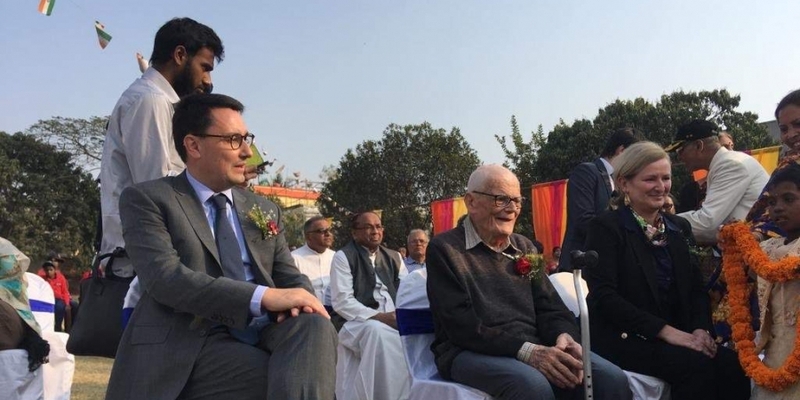 Father Francois Laborde a 92-year-old priest from Bengal was conferred with Légion d’Honneur (Legion of Honour) in recognition of his work for specially-abled and destitute children. Father Laborde has his roots in France and is the citizen of India now. Father Laborde has set up an organisation called Howrah South Point. He is the third person from the state of West Bengal to have been awarded the Legion of Honor. Légion d’Honneur (Legion of Honour) officially National Order of the Legion of Honour was instituted by Napoleon Bonaparte in 1802. The defending champions Vidarbha won the 85th Ranji Trophy title defeating Saurashtra by 78 runs in the final. Aditya Sarwate of was Vidarbha was declared man of the match for his 11 wickets in the match and 49 runs in Vidarbha’s second innings. Launched in July 1934, Ranji Trophy is the Indian domestic first-class cricket championship between teams representing regional and state cricket associations. It is named after Ranjitsinhji Vibhaji Jadeja, who was famously referred to as ‘Ranji’. The government of Assam has announced a new scheme called Arundhati to provide 1 Tola Gold, at about Rs 38K as on today, to brides belonging to all such communities of Assam where it is customary to provide gold at the time of the wedding. The scheme is named after Arundhati, wife of great sage Basistha. The US President has approved the sale of two missile defence systems for Air India One. The two missile defence systems Large Aircraft Infrared Countermeasures (LAIRCAM) and Self-Protection Suites (SPS) will enhance the security of planes flying the prime minister and the president. The countermeasure systems will also automatically counters advanced intermediate range missile systems with no action required by the crew. The U.S. Chamber of Commerce’s Global Innovation Policy Center (GIPC) released the International Intellectual Property Index 2019. According to it, India experienced its second consecutive year of growth in the IP global ranking, jumping eight places from 44th to 36th. India’s overall score has also increased substantially from 30.07% (12.03 out of 40) in the 2018 index to 36.04% (16.22 out of 45) in 2019. India’s score represents the largest gain of any country measured on the Index. The U.S., UK, and EU economies remain atop the global IP rankings, though the U.S.’s lead narrowed due to systemic challenges to the U.S patent system. India, for the first time, didn’t appear in the bottom ten per cent of economies measured. The first meeting of the US-India CEO Forum under the US President Donald Trump Administration will be held in New Delhi on February 14, 2019. The meeting will be co-chaired by US Commerce Secretary, Wilbur Ross and Union Minister of Commerce and Industry and Civil Aviation, Suresh Prabhu. Both the sides will discuss key issues such as India’s FDI rules for e-commerce and import duties on IT and electronics, and the US penal duties on steel and aluminium. Indian Space Research Organisation’s 40th communication satellite, GSAT-31 was successfully launched by Arianespace aboard its launch vehicle Ariane 5 from the spaceport in French Guiana on February 5, 2019. Saudi Geostationary Satellite 1/Hellas Sat 4 and Hellas Sat was also launched along with GSAT-31. Founded in 1980, Arianespace provides launch services for all types of satellites into all orbits. 1. When was Légion d’Honneur (Legion of Honour) instituted? 2. Ranji Trophy is related to which among the following games? 3. When was the Ranji Trophy competition launched? 4. Which state has announced the Arundhati scheme to provide gold to brides? 5. What was the rank achieved by India in International Intellectual Property Index 2019? 6. Where will be the US-India CEO Forum held? 7. GSAT-31 is India’s ____communication satellite? 8. When was Arianespace that provides launch services for all types of satellites into all orbits founded?